Getting your product in the end user’s hands safely is a given. But today’s customers don’t just want their package arriving protected; they want it packed in the most environmentally conscious manner possible. 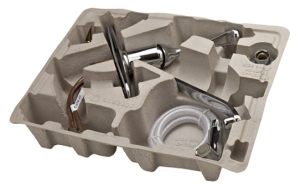 Manufacturers want to find the lowest cost method to store parts, ship goods, and reduce waste disposal costs. The purchasing and supply-chain team wants to source readily available products with prices that are predictable. Marketing executives and designers want to ensure that the consumer’s experience with the package complements the attributes of the brand. Molded pulp checks all the boxes. Molded pulp packaging has been around for over 100 years for a reason. It works. Whether you’re protecting a dozen eggs, a container of fragile parts, or a pallet of finished products going to a retailer – if it doesn’t arrive undamaged, it hurts your reputation and your bottom line. Molded pulp has excellent vibration and cushioning properties, it’s unaffected by extreme temperatures or humidity, and it’s custom molded to cradle your product perfectly. No assembly required. Whether for shipping or storing, molded pulp packaging nests perfectly and doesn’t require assembly, everything is made to order. In addition to being lightweight, the price of molded pulp is extremely stable. The material is made from a low-priced, readily available commodity, 100% recycled paper. Prototyping and production tooling is a simple, expedient process, costs are low, and the tools literally last a lifetime. Made from 100% recycled paper, packaging created from molded pulp remains the most environmentally sustainable packing and shipping material. 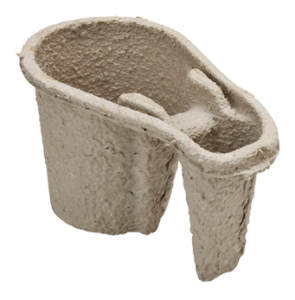 In addition to reusing viable natural (and renewable) resources, molded pulp is fully recyclable, compostable, and completely biodegradable. Just because molded pulp delivers the protection you need, is cost-effective, and environmentally sustainable doesn’t mean you need to sacrifice design. In fact, one of the most often overlooked benefits of molded pulp is that it can be engineered to exceed even the most demanding package designer’s requirements. Virtually every aspect of the finished product can be tailored to meet your requirements: size tolerances, vibration and impact specifications, weight, thickness, plus there are material finishing methods to achieve any desired aesthetic result including white and colors. For more information on why molded pulp could be the right solution for your next project, please fill out the form or contact us at 314.739.1202.